Do you feel like you are imprisoned in your company? No opportunity, no appreciation, lack of understanding of your situation, , , and no fun? I receive input from managers from time to time that sound like they feel imprisoned and helpless in their situation. I’ve been there a couple of times myself, , , hated what I was doing and who I had to work with so much that it was everything I could do just to get up in the morning and go to work. Over a career you will probably have a few situations that are tremendous and you simply love what you have. You may not realize it until it is too late. In the same career, you will probably have one or two situations that are simply miserable. I can tell you from experience that this will shorten your life if you do not do something about it. At the end of the day, you control your own destiny. Before I proceed, let me clarify something. I’ve traveled around the world and have worked with IT managers in virtually every part of the world. I know that in some countries the ability to leave a company and seek a new opportunity is much more difficult than in other countries. Likewise, to make a change in profession can be more challenging in some countries than others. However, even in the toughest situation, you are still in control of your own destiny. Ultimately, you have to make a decision, , , are you willing to stick it out and hope things get better (they certainly could) or do you want to force the issue and look for another opportunity? You have accumulated some personal capital over the time you have been with your company that will be lost if you leave. You are networked and know how to get things done in your current company. You will be leaving many of your trusted colleagues. You at least know what the issues and challenges are in your current company. You will have to start over in gaining credibility and learning how to get things done in a new company. There will be much to learn in a new company. There very well may be much better opportunity. New managers can become valuable mentors. New companies will also have problems and challenges. What I’m getting at is don’t simply discount your present situation just because it’s not going exactly how you would like it to. Be certain you consider the positives in your negative situation, , , if you step back and think about it objectively I can assure you there are many positives in your current situation. Often, people become so emotional about their situation that it becomes very hard to see the value in where they are and the capital they have developed over the years within their company. The point is this, , ,try to take emotion out of the picture and assess what you have (or don’t have) objectively and do it when you can actually be objective about it, , , not when you are angry, mad, or upset. I know people who I worked with in the mid-80’s who are still with the same company. I moved on and it was the right thing for me, but these managers are doing well and are happy where they are and have had great careers. Some who left have even gone back to work for the company which says a lot. If you do decide to make a move, I recommend you position yourself as best as you can to make a smooth transition, , , both for yourself and also for the company you will be leaving. That’s right, , , position yourself to create as little of a ripple as possible for the company you are leaving. This could be a benefit to you ten years from now, , , you never know, , , plus, it is the right thing to do. 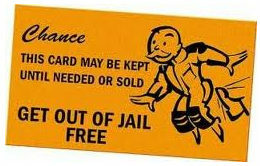 So, here is your Get Out of Jail FREE card, , , you’ve always had it, you just may not have realized it. Maybe after reading this article you might even see that you really aren’t in jail and never was, , , wouldn’t that be a great thing! Wow this post really was heaven sent! As it is the answer I was looking for… I am in the position at the moment where I am stagnating in my current role. All systems are running smoothly and there are no challenges. So I decided to look elsewhere for opportunities and found one that I am very interested in. I did what I could to impress the company (good CV, even better cover letter). So now I have to wait for feedback!